We are getting discharged! Colten has a few more tests tonight – a VCUG (please don’t ask me what it stands for – go look it up if you want to know) which will test reflux into the kidneys (schedule for 3pm), and an MRI (scheduled for 4pm) that will go “tip to tail”. The MRI isn’t really looking for anything, it’s more of a baseline of what his brain, specifically the Chiari II Malformation, and his spine look like now so we have something to compare to as he grows. As long as Colten sleeps through the MRI, or is at least mostly still, they won’t have to sedate him and we can go home TONIGHT. If they need to sedate him, we go home tomorrow morning. I CANNOT WAIT to get home with ALL my boys! And my bed. I miss my bed. The other day I had this long post ready to go about what a shunt is and what it does. Then it got erased when I lost my internet connection. So I decided I would not rewrite it unless Colten actually needed a shunt. The past three days, the biggest question has been whether or not Colten will need a shunt, and when he will need it. We were kind of on a roller coaster between thinking it would be safer to have one going home than not, not wanting to deal with a shunt at all or at least not yet, not understanding why the surgeons would want to delay it, measuring his skull, waiting for ultrasound reports, and on and on and on. While he isn’t having a shunt placed during this stay, the neurosurgeon seems pretty confident that he’ll need one in the next few weeks. So why not place it now? With a wound on his back from his spinal surgery, and then adding another surgery in his brain, he would be at a higher risk for infection. If he were to get an infection in the shunt area, he would be at risk for brain damage. We don’t like brain damage. Plus, the less a newborn has to be under anesthesia, the better. Every day an infant can go without needing a procedure/surgery, the better, so long as the benefits of waiting outweigh the risks of waiting. We have to come back on Monday for a followup ultrasound of his brain. At that point they’ll determine that it’s time to place the shunt or we’ll come back again the next week for another ultrasound. We’ll do these weekly followups until a shunt is placed. The good thing is that the stay in the hospital after a shunt placement, barring any complications, is usually only about 24 hours. That sounds odd to me because they’re probing my son’s brain. But whatever. I am not a doctor. So why will Colten need a shunt eventually? Because of the hydrocephalus, or excessive fluid in his brain. We all have cerebral spinal fluid (CSF) – it is produced and reabsorbed in the ventricles inside the brain (think of a tootsie pop – the chocolate is the ventricles and the sucker portion is the brain). The CSF coats and protects the brain and spinal cord. Normally, our body processes and moves CSF in and out of the brain, up and down the spinal column, to keep the amount in an around the brain safe and steady. When someone has hydrocephalus, the body is unable to regulate the amount of fluid, causing it to build up in the brain. Too much fluid in the brain causes brain damage by forcing the brain tissue to press into the skull. Remember? We don’t like brain damage. 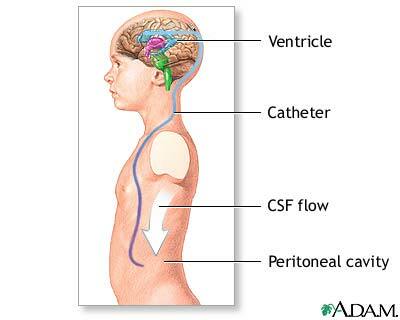 So a shunt is placed to pump CSF from the brain down to the abdominal cavity where the body can absorb it. 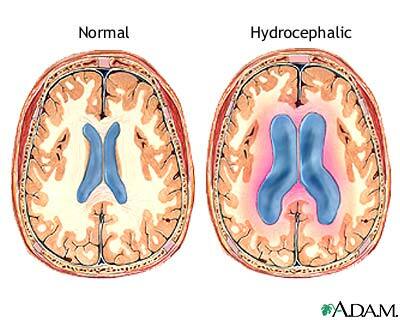 If you want to know more scientific information about hydrocephalus, you can read more HERE. But I’m not typing anymore about that because you probably don’t care THAT much about the science behind it! Chiari Type II or Arnold-Chiari malformation, is a more severe form in which the cerebellar vermis and some portion of the brain stem descend into the cervical spine. Many changes of the brain are associated with this abnormality. Although some degree of this malformation is present in the vast majority of persons with Spina Bifida, it appears to be symptomatic in about one of three individuals. So to note again, Colten is NOT symptomatic Chiari, however, this malformation does add to the occurrence of hydrocephalus. Most people with Spina Bifida and shunted hydrocephalus will need the shunt for life. The most common problem with shunts is that they can get blocked up, break or come apart. About 40 percent of shunts will fail and need changing (or revision) within one year, 60 percent within five years and 80-85 percent within 10 years. About 20 percent of people with Spina Bifida will need more than one shunt revision. So we are still waiting on the final “go” but we know that a shunt is in his immediate future. For now, we’re just incredibly excited to get HOME. Mott Children’s Hospital has been wonderful to Colten and to us and we are so grateful for the incredibly family-friendly staff and atmosphere here. But we want to take our little man home. Home sweet home!!! Hugs and best wishes to all for an easy transition!! Katie, congratulations on the birth of Colten! He is precious. Kelly G. just passed on your site to me and I appreciated reading about your journey so far. Our son Gabe is just 2. Yesterday we had our Neurosurgeon visit. I just wanted to share that while our situation may not be typical, it is encouraging. There is a lot of a lot of changing research about the necessity of a shunt, the possibility of children with SB being predisposed to delayed CSF reabsorption (meaning that by waiting until 15-18 months of life it is possible that the hydro will self correct) and that shunts are not the only option for babies under a year of age. I wrote a little bit about our experience on Gabe’s blog: http://www.sobeautifullymade.blogspot.com/2012/09/wait-for-it.html if you are interested in reading it. But, I also totally understand the feeling of being overwhelmed by too much information and needing to turn off the extra chatter. Hugs to all of you as you navigate these new waters and figure out life at HOME! 🙂 as a family of 5! Your family and Colten are in my thoughts and prayers!!! I have had to deal with, think about, and make decisions exactly like these!!! Caitlyn had her shunt put in at 10 days old. I am praying for you and hope for an awesome outcome!! Please feel free to contact me for any questions or anything. Cailtyn is almost 14, with a T-7:T-8 level. Hugs to your family!!!! !